The townhomes at Cobblestone Cove are the premier waterfront vacation rentals along the North Shore in Grand Marais. You will be within easy walking distance of everything to see and do in Grand Marais. Cobblestone Cove Unit 3 is a cozy townhome with great amenities and walking distance to the lighthouse, shops and restaurants in Grand Marais. 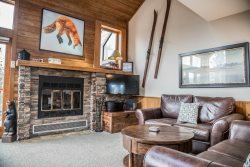 Cobblestone Cove Unit 4 is a Lake Superior vacation condo with the look and feel of luxury and comfort for a perfect Grand Marais vacation destination. Cobblestone Cove Unit 6 is a great place to watch the waves crash on the break wall of the Grand Marais Harbor and gaze at the sail boats and nearby lighthouse. Cobblestone Cove Unit 10 is a spacious vacation townhome along the waterfront of the scenic Grand Marais Harbor.